Earnings season is a quarterly event that is much anticipated by traders. The reason is that earnings reports themselves can be newsworthy events and it’s newsworthy events that creates and reinforces the perceptions of the investing and trading community which in turn leads to trading action. If a sector giant (such as Intel, Exxon/Mobil, GE, Amgen, etc.) posts better than expected numbers, this not only bodes well for that particular stock but also for its sector. If the sector is influential in the pricing of certain market indexes, then a rise in one key stock can raise the overall market. This is why traders especially love earnings season because it gives them something to play with for a couple of days at least. Investors look at the full earnings report for longer-term investment indications. So, if one’s a trader, what is the best way to play earnings and what are some of the key ingredients that make a stock pop or drop? To address these issues, I’ll be using the chart of data storage and software security company Symantec (SYMC) because it’s chart is a graphic illustration of the effects of both good and bad earnings reports. Earnings data for the past two years are summarized in the chart below. Holding stock over earnings is a usually a suckers bet unless there’s nothing to lose. Sometimes a negative earnings report can pop the stock because it wasn’t as bad as Wall Street expected, but that’s not an easy call to make. Usually, most stocks go down after earnings and you don’t want to be the one left holding the bag. Post-announcement plays are a good move, too. Companies that guide higher than Wall Street expectations can ride the wave upward typically for as long as the overall market holds up (barring any negative news on the company). On the flip side, lowered guidance combined with a bear market can be profitable for short positions, but short positions are riskier enterprises with shorter holding times. I hope you’ve gotten a feel for how to make some profitable earnings plays. As always, paper-trade your strategy before committing real dough and check out the StockMarketCookBook.com for further earnings recipes. I’ve mentioned in blogs of days past about Fibonacci ratios and how they are used by market technicians and traders to determine support and resistance levels, but I never defined them. Seeing as how popular they are and how they really do reflect price movement, I thought I’d provide a short overview of the subject so that you’ll know what they are when people mention them. What is a Fibonacci number? The golden mean has significance in many areas of art and science, and it also plays a prominent role in stock chart analysis. But the 61.8% level is not the only level of significance–levels formed by other ratios provided insight into trading psychology, too. These other levels are determined by the ratio of two Fibonacci numbers separated by one, two, or three numbers. For example, the next important Fibonacci level is given by 89/233 = 0.382 or the 38.2% level. Of lesser importance is the next level, given by 55/233 = 0.236 or the 23.6% level. You should note that although the 50% retracement level is not a Fibonacci level (I know it can be derived from 1/2 but from no other Fibonacci numbers) it is considered to be an important psychological trading level and so technicians include it in their analysis. What these Fibonacci levels do is provide a clue as to intermediate levels of price support and resistance between two extremes. To find these levels, subtract the vertical distance between two extreme points and divide that by the key Fibonacci ratios of 23.6% (0.236), 38.2% (0.382), 50% (o.50), and 61.8% (0.618). Note that Fibonnaci levels aren’t always exact but they do provide decent ballpark numbers. 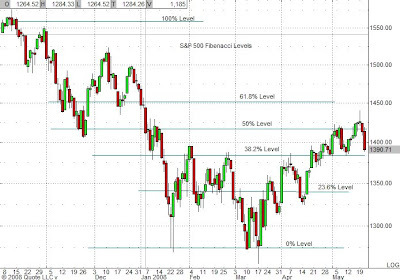 The figure below is a recent chart of the S&P along with key Fibonacci levels. Many charting programs include Fibonacci ratios in the form of retracement levels, arcs, and fans. Note that the strength of a level intensifies with each price test so that when the level is finally broken, the price movement will be particularly strong and trades made on that breakout generally have a much better chance of success. As with other indicators, Fibonacci ratios aren’t always accurate, so use them as a guide to your trading rather than as an overall trading strategy. They are particularly useful in placing stop-losses or setting price targets. Some traders use pullbacks to Fibonacci levels to add to existing positions. Fibonacci ratios are also used in Elliott Wave Theory, Gann retracement levels, and in Gartley Patterns. Cooking Tools #3 showed how candlestick formations can be used to determine reversals in price trends. What I really should have done first was to give a primer on basic candlestick formations which would provide you, dear reader, with the building blocks for the more complex patterns I’ll be detailing and referring to in the near future. Candlesticks are extremely useful tools in technical analysis and with proper application, they can make a significant difference in your trading success. So, if you’re unfamiliar with them, this is a great place to start. There are many other worthwhile candlestick resources, both online and in book form, and I strongly encourage you to peruse them for further information. As discussed in Cooking Tools #3, a candlestick is one way of representing the high, low, opening, and closing prices during a specified time period. The candlestick is composed of a body which is defined by the opening and closing prices and a shadow, wick, or tail (all three terms are used by chartologists) which extends from the body to the high and to the low prices for that time period. (See Cooking Tools #3 for a breakdown diagram of a candlestick.) If the price closes higher than the open, the body is traditionally colored in white (some folks like me prefer green) and represents a situation where there are more buyers than sellers. On the other hand, a black (or red) body signals that the price closed below the open and indicates more sellers than buyers. To a large extent, candlesticks are a measure of market sentiment which is how they are interpreted and why they are so useful. What a candlestick doesn’t tell you is what the price action was like in the interim–something to keep in mind especially if you’re looking at candlesticks marking larger time frames. Long Day/Short Day: A long day shows a large price movement from the open to the close, and conversely for a short day. Marubozo: This is a candlestick with a bald head, meaning there’s no wicks on either end. This signals that the open and the close represent the high and the low of the day respectively showing conviction in price. Spinning Tops: These signal indecision marked by have small bodies and long wicks. They are generally more meaningful as part of more complex patterns. 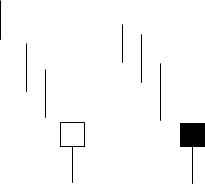 Doji: Doji (the plural of doji is doji) form when the price closes at or very near the opening price signalling a tug of war between the bulls and the bears. 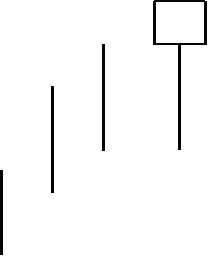 Doji are important candlestick types which are typically found in market reversal patterns. Different types of doji signal different market conditions. Dragonfly: The opening and closing prices occur at the high of the day. Gravestone: The opening and closing prices occur at the low of the day. Long-legged: The open and closing prices occur near the middle of long wicks. Umbrellas: Umbrella formations include hammers and hanging men and are also used to identify market tops and bottoms. (See Cooking Tools #3.) An umbrella consists of a narrow body usually with little or no upper wick but with a long lower wick. When an umbrella forms at the bottom of an extended decline, it’s called a hammer; if it forms at the top of an advance, it’s called a hanging man. Both formations signal a reversal in price movement. Yes, I’m still bogged down in my stop-loss research. Since all of my lackeys are on vacation (haven’t they heard of a staycation? ), I’ve got to do it myself. Sigh. Anyway, I guess the candlesticks formed yesterday weren’t lying. The market did go down today. Yay me for predicting it. Boo Mr. Market. I’ll be watching to see if the VIX breaks above 25. If previous history is any indication, every time it has done that it has also risen above 30, and since the VIX and the market move inversely to each other, this has meant new relative lows for the major indices. Now the VIX isn’t the only indicator of market direction–there are other indicators used by traders such as the equity put/call ratio, the Arms Index (aka the Trin), and the Tick. Today I’m going to introduce the Tick for those of you unfamiliar with it. What is the Tick and why should I care? The Tick is nothing more than an indication of directional movement. You can look at the tick on individual stocks or on market indices. Since we’re more interested in the markets right now, we’ll be referring to the Tick on the S&P 500. Before decimalization, one tick represented the smallest increment in price, say 1/8 or 1/4 of a point. Nowadays, it reflects whether a stock is trading to the upside or the downside. The Tick on an index, however, is slightly different–it reflects the difference between the number of stocks that are trading on an uptick with those that are trading on a downtick. Clearly, if there’s a lot of selling, the tick will be a negative number. In general, the majority of Tick values range between 1000 and +1000 on “normal” trading days, but it’s those days when the Tick enters extreme levels that traders should take note of. Extreme values on the Tick range from around +2500 and above and from -2500 and under. When the Tick hits one of these extreme values, a market reversal is either imminent or will usually occur in the very near future (within a day or two). What the Tick can’t tell us, unfortunately, is the extent of the reversal–it could last for months or only a few days. 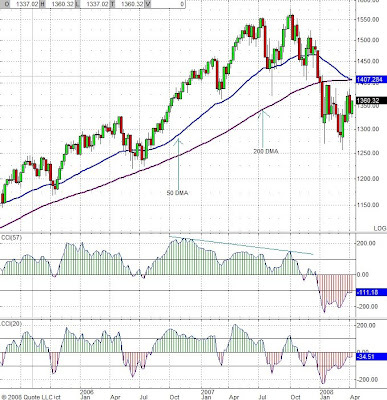 Compare the daily charts below of the S&P 500 with the Tick. Now you have another tool to put in your arsenal of indicators. Note that by itself the Tick isn’t perfect; it’s best used in conjunction with other indicators. Not only can the Tick be used to predict daily price movement, it can also be used successfully as an intra-day indicator which daytraders might find useful. (When I was daytrading S&P futures, I used the Tick combined with the Trin, but I’ll leave that discussion to another day.) Motto: The market won’t tick you off if you take note the Tick! A useful tool that traders use to determine when a stock is breaking out is the Cup and Handle (C&H) base. William O’Neill, the founder of the daily financial newspaper Investor’s Businees Daily (IBD), was the first to coin the phrase in his book How to Make Money in Stocks which is a valuable resource that every serious investor should read. This chart pattern forms the basis of O’Neill’s CANSLIM method. It’s a proven method of identifying stocks that are breaking out and one that deserves a closer look. If you’re unfamiliar with this chart pattern, read on. My point here is to acquaint you with the pattern so that you’ll know what to do should it arise in the chart of one of your stocks or if you see it while perusing the charts of others. The basic pattern looks like a rounded cup with a smaller handle and represents a triple top. The shape typically looks like a drawn-out, rounded U shape rather than a sharp V. You want to look at the overall cup shape since minor fluctuations within it are usual. The pattern can last anywhere from two months to two years, In general, the longer the cup takes to form, the stronger it will breakout. The usual correction from the top of the cup (point A on the chart below) to the bottom (point B) typically varies from 12%-33%. Downturns greater than that suggests that there is something fundamentally wrong with the stock and should be regarded with caution. The left side of the cup is accompanied by an overall decrease in volume (there may be the occasional volume spike in there due to some sort of news) , and the right side of the cup is formed on gradually increasing volume (point C). The handle is formed after the base is completed where the price returns at or close to the left side of the cup. Traders see that the price is returning to its resistance level and begin exiting their positions, thus forming the right side of the handle (C to D on the chart). Note that the volume decreases during this period. You should note, too, that the bottom of a true handle should never be more than the low point of the base. It’s okay if the right side of the cup is lower than the left side, but if it’s too much lower, then the subsequent breakout needs to be stronger. 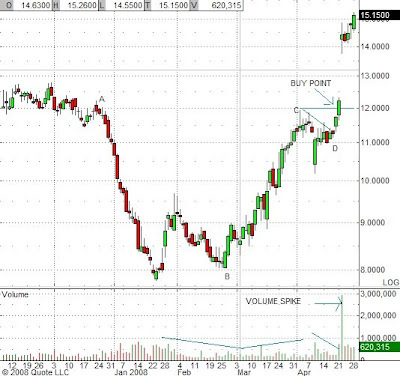 The recent daily chart of Volterra Semiconductor (VLTR) illustrates the cup and handle pattern. How to play it: On daily charts, handles typically take one to two weeks to complete their formation. The way to play this pattern is to wait until the handle has formed and the stock breaks the high point of the cup’s right side (point C) or what O’Neill terms the pivot point. This breakout must occur on heavier than normal volume (at least 50% heavier) for it to be a compelling buy. If the stock breaks out on mega-volume, this is a signal that institutions are pouncing on it and you should be, too. 1. You may have been patiently following the stock and noting its pattern, but it is foolhardly to buy the stock before it reaches its pivot point. Why? Many stocks just do not make it back to their pivots and end up declining in value. You need to wait for the stock to prove its strength before jumping in. 2. Many stocks breakout without ever forming handles. A handle isn’t completely necessary but stocks that form cups without handles are more prone to failure. 1. Buy the stock by entering a quarter or a third of your intended position at the breakout. Wait several days or weeks to gauge the strength of the price movement. If the general trend of the stock is up, keep adding to your position on price dips (such as when it hits a supporting moving average). 2. Buy call options in increments mentioned above. You can also sell out-of-the-money puts to finance your calls. 3. Call ratio backspreads. This is a fancy term for an easy concept. Here, a lower strike call is sold (usually at a strike close to the pivot point) and two (or more) higher strike calls are purchased. I won’t get into the details of this strategy here, but I wanted to mention it because it’s a favorite of many options traders who use it to play breakouts. The beauty of this strategy is that it sometimes can be put on for a credit (or a very small debit) while minimizing margin. Should the stock move a lot in either direction, a profit is realized (if the stock was put on for a credit). Even if the stock doesn’t move, the amount that one risks is usually less than if one had purchased the stock outright. If you’re not familiar with this strategy, you can check it out using the options links on this page. As always, it’s prudent to paper trade any of these strategies for a few months before putting your own hard-earned cash on the line. For more information, check out Investor’s Business Daily and Bill O’Neill’s book. IBD has daily charts that include stocks that are currently forming cup and handle bases. Day-trading C&H patterns: The cup and handle pattern isn’t just the province of long-term investors; many day-traders use this pattern on five minute or even one minute charts. Usually when a stock makes a dramatic climb at the beginning of the day, it spends several hours testing its new level. This is when you might see a cup and handle form. If the overall market is still trending up, the stock may make a breakout late in the day. Sometimes the stock will break out right before the close. This is a good time to buy as the odds favor a strong breakout gap when trading resumes the next day. Probably the most important decision regarding trading stocks is when to get into a trade and when to get out of it. Traders use many technical indicators to determine this. The more popular devices are moving averages, support and resistance levels, price patterns, and candlestick chart patterns. (Price patterns and candlesticks were the subject of Cooking Tools #1 & #2.) Today we’ll be looking at another tool to add to your arsenal of timing tools: the CCI which is short for the Commodity Channel Index. The CCI was developed by Donald Lambert who introduced it in an article in the October 1980 issue of Commodities magazine (now Futures). It has since grown in popularity and is used by traders to identify cyclic trends not only in commodities, but in equities and currencies as well. Although it works best in cyclic markets, it can be also be used in trending ones too as we’ll see shortly. Essentially, the CCI measures how far away price is from the moving average and how fast it moved to get there. If the price is right at the moving average, the CCI value will be at zero. The constant (0.015) is used in the above equation as normalizing factor. It restricts about 80% of the values to be between -100 and +100. The theory here is that when the CCI goes way outside either of those two boundaries, the stock is either oversold or overbought. Most advanced charting services offer the CCI. On a chart, it is commonly represented by a series of bars that are centered around a zero point. (See chart below) The trick to setting up the CCI is in the choice of moving average. Lambert suggests using 1/3 of a price cycle where a price cycle is defined as the number of days (or other time unit) between successive price highs or lows. For example, if a stock makes a low about every 90 days, then a 30 day moving average is used. From my experience, however, sometimes you need to play around with it to get the best fitting moving average. Be aware that sometimes the stock will change its cyclic rhythm, so what time interval has worked in the past may not work as well in the future. (Note that most charting services use a moving average of 20 as the default.) The following is a weekly chart of the S&P 500 comparing a CCI with a 57 day moving average (which I derived from using price lows) with a CCI with a 20 day moving average. There are two ways to interpret this oscillator–one as a straight indicator and the other as a divergence indicator. There are many ways that this can be used as a straight indicator. One way is to go long when the CCI rises back above the -100 level and to sell when it drops below the +100 level. However, this can lead to a lot of whip-sawing. A better way is to go long when the CCI crosses into positive territory (above zero) and exit the long position when it falls below zero. I like to wait a day or two on either side for confirmation before entering or exiting a position. You can see from the above chart that if you were long the S&P, the CCI(57) would have kept you long until this past January when it finally dropped below zero for two weeks. But the divergence in the CCI for the months preceding the drop would have clued you in to the fact that the market was heading for a reversal. This is the other way to use the indicator. If the stock is making new highs but the CCI isn’t, the two are said to be divergent and a price reversal is on the horizon. Another way to identify when a stock is greatly overbought or oversold is to look at the magnitude of the CCI. Extreme values–over +300 or under -300–signal that a stock has moved way beyond its moving average making a correction highly likely. This “tell” is especially useful if you have a short position. Any move off an extremely negative CCI number is a signal to cover. Day traders will find the CCI to be a useful entry and exit tool, too, especially if several time-frames are viewed simultaneously. I used this method along with other indicators to daytrade the S&P Emini futures. It took me a month to get the hang of it, but it eventually worked out very well (although it burned me out!). Because it’s an oscillator, the CCI used by itself works best in sideways markets; in trending markets the CCI alone will lead to false buy and sell signals. This is when you need to loosen your interpretation of the indicator and only pay real attention to it when it crosses the zero line. Other indicators (like the ones mentioned at the top) used in conjuction with the CCI will help you to winnow the false signals from the real ones. If you’re a beginning investor, you’re probably looking at this title thinking that a candlestick is something used by Mrs. Green to off Colonel Mustard in the library. In the non-Parker Brothers world of investing (although successfully identifying chart patterns does involve a bit of detective work), candlesticks are a graphical representation of price and price patterns. Whereas a point and figure chart is represented by a series of vertical lines with horizontal handles that represent the opening and closing prices over a specified time period, a candlestick chart represents the same information but more graphically as illustrated in the diagram below. The main portion of the candlestick is called the body. If the closing price is lower than the opening price, the body is typically shaded either black or red. In the reverse case where the closing price is higher than the opening price, the body is typically either white or green. (Some charting programs will let you select the colors for your candlesticks. I prefer the green/red schema.) The lines above and below the body are called the wick or shadow. They reflect the high and low price for that time period. Candlestick patterns are a graphical representation of investor psychology, and learning how to interpret them provides insight into market movement. Although there’s an entire field of chartology devoted to candlesticks, I’m just going to touch on a few of the more useful and predictive patterns, specifically those that signal a market reversal after an established trend, so that you will be able to identify them and know what to do if these patterns crop up in your charts. This is just a brief introduction to candlesticks. There are many books and websites that cover candlestick interpretation for those interested in learning more. I wanted to introduce these concepts to you because I’ll be mentioning these chart patterns throughout my blogs. Tomorrow I’ll see if I can find some charts that illustrate these patterns so that, unlike Colonel Mustard, you won’t get clobbered by an errant candlestick should it appear in your stock charts. Continuing with yesterday’s introduction to chart patterns, today we’ll be looking at chart pattern reversals. These are useful tools in determining when a stock may be setting up for a reversal in price trend. Included in this discussion are double tops and bottoms and head-and-shoulders (not to be confused with the dandruff shampoo). Other reversal patterns include broadening formations and triangles, but they’re not as easy to spot nor are they as reliable. Since there are many books and websites that discuss these patterns in depth, I’m only going to touch on the salient points so that you will be able to identify them and know what to do when you see one. A double top or bottom looks exactly what it sounds like. A double top looks like a rounded M and a double bottom looks like a rounded W. For simplicity, I’ll discuss the characteristics of a double top; the commentary for a double bottom will be the reverse. Characteristics: A double top occurs after a significant run-up in the stock, usually on the order of months or even years. The pattern is composed of two peaks of roughly equal height (they should be within 3-4% of each other) with a trough of about 10-20% off the peak high in the middle. The distance between the two peaks can be from several weeks to several months; too close and this could just represent normal resistance rather than a lasting change in the overall supply and demand. Once you learn how to spot a double top you’ll know the difference between a minor fluctuation and a major reversal pattern. How to play it: After the second peak has formed, the stock will decline on increased volume and/or experience downward gaps. What you want to do is wait and see if it will break the support line which is the horizontal line that goes through the peaks and touches the base of the trough. If it does break this line, it must do so on increased volume. A general rule of thumb is to wait a few days after the break before entering a short position (or selling the stock if you were long) to see if the break is real. Once the support line is broken it becomes resistance, and any retracement back to this line can be viewed as another chance to exit your long position and/or initiate a short one. Price target: Subtract the peak value to the support line from the support line for a price target: Price Target = Support Value – (Peak value – Support Value). It follows then that the bigger the double top formation, the lower it can be expected to go. If you had shorted just below the support line break, you can expect to cover when it reaches its price target. A head and shoulders pattern is one of the most powerful and reliable chart reversal tools. It’s very smiliar to a double top except that it has an additional higher peak called the “head” located between the two lower peaks called the “shoulders.” The “neckline” is the support line drawn at the base of the troughs joining the head and shoulders. This line doesn’t have to be horizontal; a sloping line is okay. Volume is crucial here. The volume of each successive peak must be less than the volume of the previous one. Overall, the volume should experience a significant decline during the course of pattern formation. If you have both the shape and the volume criteria, then you have correctly identified this powerful reversal pattern. Head-and-shoulder patterns typically take a couple of months to set up, although some can take longer. How to play it: You play this exactly the same way as a double top. Price Target: The price target is the same as in a double top except that you’ll be using the top of the head as your point of subtraction: Price Target = Neckline (support) value – (Top of Head value – Neckline value). Note that other considerations can come into play when establishing a price target such as major support and resistance levels, Fibonacci levels (don’t worry too much about that right now), and major moving averages. Note: Since this pattern is so reliable, it is also very profitable and much coveted by traders. It is also a rare one, but I’ll see if I can dig up a few stocks that are exhibiting this pattern so that we can follow their price action. You are currently browsing the archives for the Cooking Tools category.